As you may remember, our 12 Fuhrmann managed farms, our mill in Trelew as well as the Schneider Group mill Pettinatura di Verrone just got RWS certified this year. RWS is the Responsible Wool Standard issued by the non-profit organisation Textile Exchange. 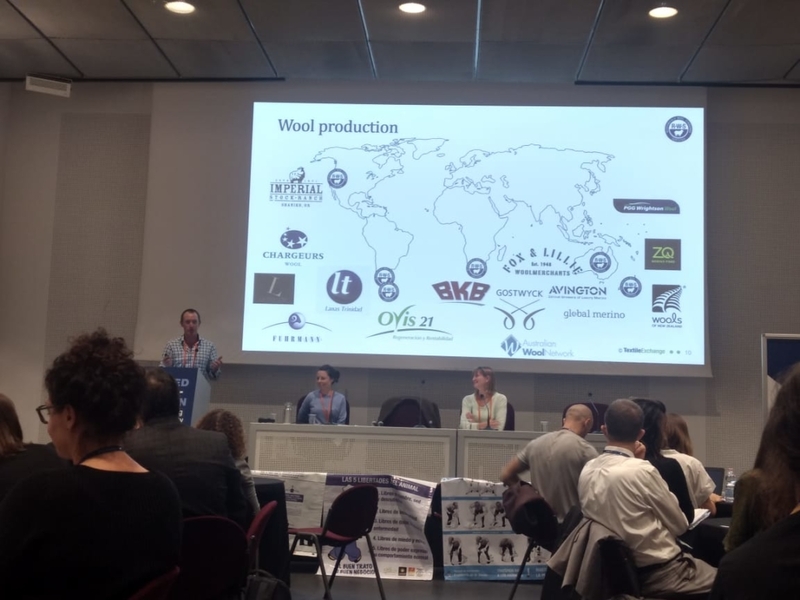 The wool standard is just one part of the organisation’s activities as it provides a platform for all sustainability questions related to all textile fibres and production stages. Textile Exchange’s annual conference is a meeting point for members of the whole textile supply chain to discuss pressing issues of reducing the impact of the textile industry on the environment. As a small delegation of four team members from the Fuhrmann and the Schneider Group we attended the three-day event. This gave us the opportunity to meet with many different people and also attend a wide variety of parallel sessions. On the first day, we attended the Responsible Wool Standard Working Group meeting. This was particularly interesting for us, as we got to meet other wool companies who are also RWS certified. But more importantly, we got to meet with apparel brands who are interested in sourcing RWS certified wool. We were particularly interested in learning about the first successful farm to retail RWS collaborations where brands have launched RWS certified wool products to the market. Examples were Eileen Fischer, Marks & Spencer as well as H&M’s upper market brand Arket. During the course of the next two days of the conference, we learned about the recent research and strategies on issues such as recycling, circular economy and regenerative supply chains. Three topics were of particular interest to us. One important element to build sustainable textile supply chains is traceability. The industry can only improve based on what can be measured. In order to measure the supply chain from fibre to fashion needs to be traceable. In addition, being able to know where a product comes from and how it was made also builds trust among retailers and consumers and therefore also adds value to the final product. Last but not least, traceability is also a chance for example for the wool grower at the beginning of the supply chain to get feedback about what happened to the wool. The Fuhrmann supply chain is already fully traceable from our farms to our mill and we will continue to be working in this direction together with our clients. Another important topic discussed was water stewardship. Water-related natural disasters, water scarcity and water-related conflicts are part of everyday life worldwide. The Apparel and textile sources from and operates in water-stressed regions of the world. This means that the textile industry faces physical, reputational and regulatory water risks. This situation calls for businesses to develop water stewardship strategies to reduce water risk while also contributing to water security. Water stewardship strategies entail collaborative solutions, partnerships and collective actions. Another pressing topic is microplastics. When it comes to textiles the concern is microfibres, these are very small pieces of fibre which break off from the yarn used in textiles during washing or use and end up in our water systems. This is particularly dangerous where microfibres are made of synthetic fibres which do not biodegrade unlike natural fibres such as wool. For the moment there is much speculation on the source, volume and impact of textile microfibres. However, at the conference, we learned that several organisations, brands and research institutes are joining forces to conduct research on microfibres. Overall the conference was a good learning experience and motivated us to continue following and implementing our own sustainability strategy for our wool supply chain from farm to wool top. We will keep you updated here on how we move forward.